Automotive HVAC (Heating, ventilation and Air Conditioning) system represents one of the major auxiliary loads acting on the engine. Several studies show that the automotive A/C system is responsible for about 28% of fuel consumption, 71% of CO and 30% of HC emissions respectively. Automotive manufacturers from around the globe have shown significant efforts to optimize the HVAC design in terms of improving its efficiency, weight as well as environmental effects. However, with complex automotive designs evolving rapidly, there is an immense need of developing flexible and sustainable components that can synchronize well with the overall design characteristics. This necessitates manufacturers to adopt new technologies for effective analytical solutions that assist in optimizing the component design. 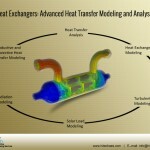 The use of CFD to evaluate automotive HVAC system is highly significant, and is being adopted widely by most manufacturers. Use of species distribution and convection analysis assists in optimizing air flow distribution for complete thermal comfort of the occupants inside the cabin, considering the constraints developed by the components. With wake and vortex analysis, the HVAC blower can be evaluated for the development of adequate pressure head to distribute air into the cabin properly. However, with an increase in pressure head, there is a rise in noise level due to complex duct bends, blower rotation and turbulent flow generation. With CFD simulations, it is possible to optimize the blower design to minimize noise frequencies and excessive generation of turbulence. 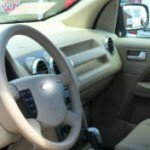 An HVAC system for a car cabin does not maintain a homogenous comfortable thermal environment for the occupants as opposed to the HVAC systems for buildings. This non-uniformity is essentially due to the angular solar loads, thermal mass variations as well as occupants’ metabolic and psychological changes. To address this complexity, modern CFD packages include thermo-physiological models that provide analysis on thermal inertia, blood circulation and body temperature variations as well. 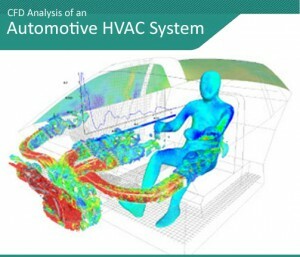 Comprehensively, CFD analysis benefits automotive HVAC designers to obtain optimized design solutions that apart from performing their core operations efficiently, also help in reducing fuel consumption and exhaust emissions.